The University of Michigan's American Consumer Satisfaction Index has come out today with it's new findings. It shows that even though the US may be in a recession that things are doing better. The overall ACSI has risen 1.4% from where it was just a year ago at the start and, what some might say, the worst of the recession. Well, some of you might be wondering what the heck the American Consumer Satisfaction Index even is. I'll let them tell you what they are. "Developed at the University of Michigan, the American Customer Satisfaction Index is a national economic indicator of customer evaluations of the quality of products and services available to household consumers in the United States. It is updated each quarter with new measures for different sectors of the economy replacing data from the prior year. The overall ACSI score for a given quarter factors in scores from about 200 companies in 44 industries and from government agencies over the previous four quarters." So, it is pretty much an indicator of if people think the stuff they are buying is worth the money. 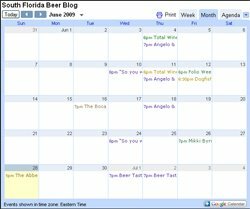 Beer has been one of the categories that is studied by the ACSI that has been on an increase since the recession has started. 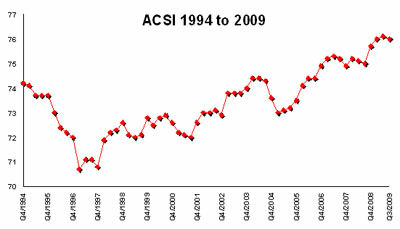 It has risen 1% to 84% since the last quarter to its highest rating since the ACSI was started in 1994. The study only covers the macrobreweries with Anheuser-Bush InBev with the biggest increase of 4% to 85%. Miller is up 1% to 83% and Coors is down 2% to 81%. There is another section for All Others(no further breakdown on that section) that has an increase of 3.7% to 85%. The increase in AB InBev is accredited to it's lower priced brands like Natural Light and Busch and also for new products like Bud Light Lime and Golden Wheat. Coors decrease in score is accredited to a larger portion of its portfolio being higher priced brands. The merger of Anheuser-Bush and InBev has been a factor in it being able to keep it's prices down by cutting some of it's cost by selling off it's theme parks, cutting 1,000 jobs, and overhauling the management at the company. In the future I would like to see how the microbrewies play in and what their ACSI scores would be in comparison to the macrobreweries. What would kind of score would you give your favorite breweries? Which ones do you think are worth the money?